Yancey, Philip. Vanishing Grace: What Ever Happened to the Good News? Grand Rapids: Zondervan, 2014. In this book, Yancey takes a look at the way Christianity interacts with culture, specifically Evangelical Christianity. He makes a number of good points that will make Evangelicals consider the way they have been reacting to moral issues. He draws from the Bible and from church history to show how some of the greatest moments of the church were in times when Christians were not in political authority. The book will make a great discussion starter for small group discussions, Christian university courses dealing with society, and for Christian book clubs. While I may not agree with every point the author made, his work will make me consider why I think the way I do. I am not a fan of the hidden end note style which appears to be what this book will have, but since this was an advance e-galley provided by the publisher for review through NetGalley, that may have changed before it reached the final printing. Diamont, Anita. 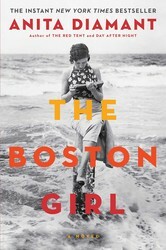 The Boston Girl: A Novel. New York: Scribner, 2014. Addie Baum was born to immigrant Russian Jews. She grew up in Boston. The book is a chronicle of her growing up years, her early adulthood, and her courtship. It offers a glimpse of what life was like for Jews in Boston in the early 20th century. Addie is a likeable character, and readers can empathize with her and enjoy the way that she always seems to land her feet when adversity occurs. I enjoyed the book tremendously, but it did not hold me completely captive. The story is written from the perspective of Addie as grandmother relating the story to her granddaughter. I received an advance reader's copy through NetGalley for review purposes.